5 % discount on all Standard Stain orders in KEYLINE & ENCORE. Excludes Signature finishes, Special Request and Color per Sample stains. Crystal Cabinetry is a full custom line of cabinets, providing traditional inset styles or full overlay options. Crystal Cabinets are engineered to exacting specifications and constructed from superior furniture-quality materials. 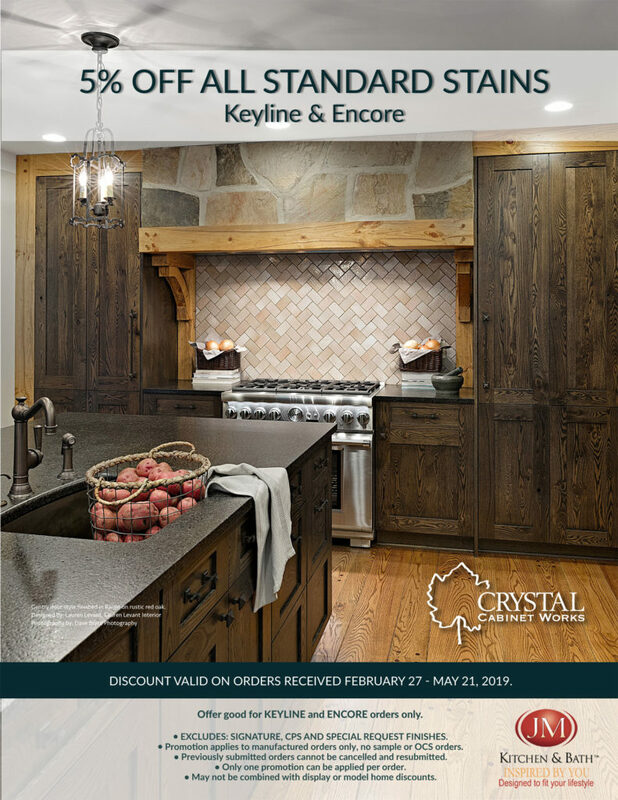 Discount applies to orders received by Crystal Cabinets now through May 27, 2019. This offer is available to new customers looking to update their kitchen, bath or any room in their home. Offer good for KEYLINE and ENCORE orders only. • EXCLUDES: SIGNATURE, CPS AND SPECIAL REQUEST FINISHES. • Promotion applies to manufactured orders only, no sample or OCS orders. • Previously submitted orders cannot be canceled and resubmitted. • Only one promotion can be applied per order. • May not be combined with display or model home discounts. Crystal Cabinets offer 15 wood choices standard, 11 specialty wood species, 45 standard finishes, 5 specialty finish options, 79 stylized doors, and fully customizable doors, finishing and distressing packages, Crystal can create the look you’ve been dreaming of. Green-Core by Crystal is an environmentally friendly product. Be sure to check out all the current specials JM is offering new clients at both the Denver and Castle Rock locations and ask your designer about any floor model appliance specials at your appointment.